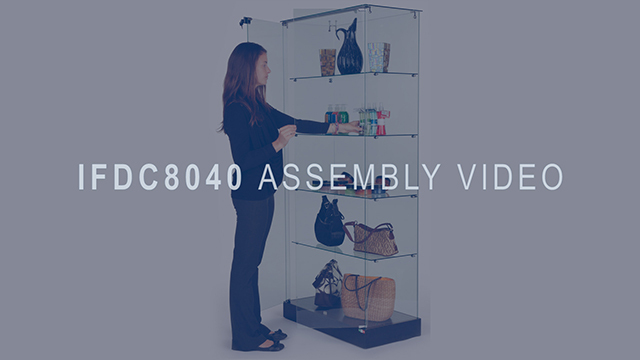 Check out this assembly video to get a better overview on how to setup these store showcases. The assembly is straight forward, and can be setup in no time with a little bit of help. Watch this instructional video so that you can immediately start displaying your products in these beautiful store showcases. Install adjacent side(in the same manner as the previous side). Place "O" ring on supports. Move top glass into position. Aluminum rail may need to be attached to glass top(see included instructions). Align bracket holes with glass holes. Place pivot collars into pre-drilled holes. Place door with bottom hinge into bottom pivot collar. Place top hinge with pivot collar into pre-drilled hole. Slide door glass into hinge. Repeat this procedure for opposite door. Install the lock mechanism as shown. Test your door swing & lock for proper fit.